I’d like to introduce you to Ab[Screenwear] – a New York-based luxury fashion label and material experimentation lab that aims to recontextualize our relationship to the digital screen. 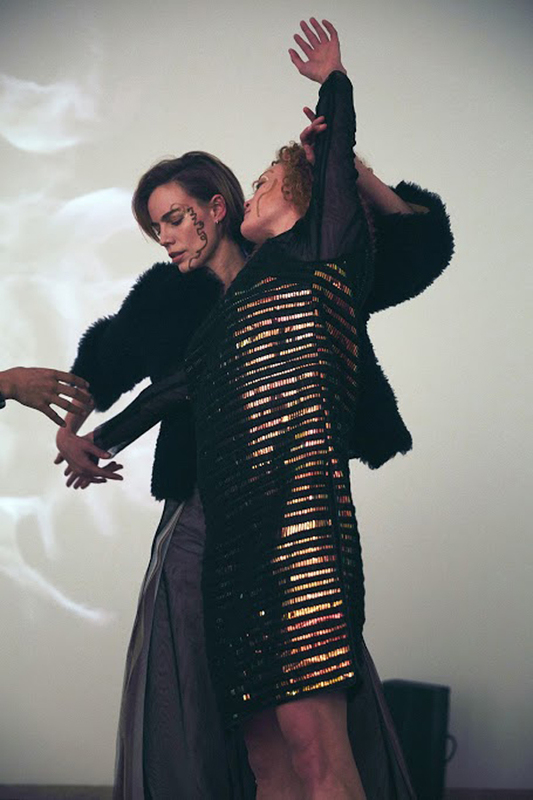 Founded by Ralph Lauren and Maiyet alum, Olya Petrova Jackson’s Ab[Screenwear] is both a high-end fashion atelier and conceptual project that positions the screen, in essence, technology’s “skin”, centrally in the contemporary experience of wearables. 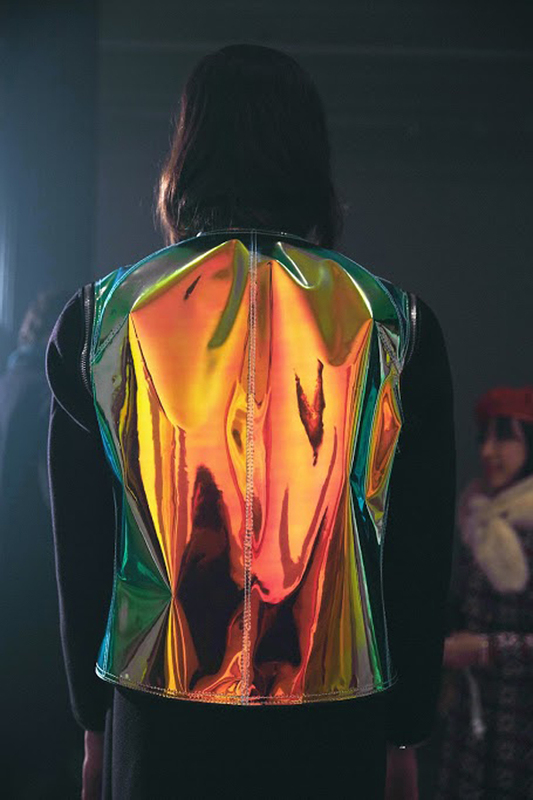 Iconic jackets feature light-responsive holographic panels made from pliable hand-treated architectural material, through which touchscreens are operable. Choupette Social Girl: Define “RGB is the new black”. CSG: What is the fashion industry’s relationship with the digital screen? OPJ: In fashion industry, we are all heavy users of screen as utility and as visual reference. Our everyday exposure to technology and screens informs designers’ choices of materials and silhouettes in big ways. From Raf Simons to Christopher Kane to Nicholas Ghesquiere and Karl Lagerfeld himself – collections are breathing with screen-like qualities – some are very straightforward, others are rather subtle, i.e. transparencies, overlays, lightness, angular shapes and more. CSG: In layman’s terms, how are the clothes created? OPJ: Ab[Screenwear] is a continuous work in progress. The dichroic screen-like material that we use at Ab[Screenwear] is sourced from architectural glass finishes and treated in several stages before becoming pliable to garment construction. This material acts more like a placeholder for what Screenwear can be in the future. Right now, Ab[Screenwear] panels are touch screen operable: you can navigate your phone through pockets, overlapping parts. By toying with the idea of one’s digital self – “selfone” – exposed and represented via screens, we lay the groundwork for Screenwear as a future medium. The dream is to see it full body one day. From our Chinatown studio, we develop prototypes, perfect fit, source new materials, develop fabric combos, applications, attachments. One of the recent collaborations with Tereza Barabash from Lviv, a multimedia artist and weaver. In pursuit of a slower, more gentle approach to material waste, we recycled our earlier screenwear prototypes and production leftovers (TPU, leather, mesh) into new precious, demi-screen fabric using a floor loom. Speaking of, this collaboration happened almost entirely via computer screen. Somehow software & multimedia – computer interfaces as a whole – seem to be a big part of my design process. Maybe it is because, ironically, I tend to spend more time in Adobe than I do in fabric stores:) Maybe it is because today’s designer doesn’t design for a physical body only, but also for a digital one. CSG: How do you incorporate luxury materials? OPJ: I like combining luxe and humble and/or technical materials. 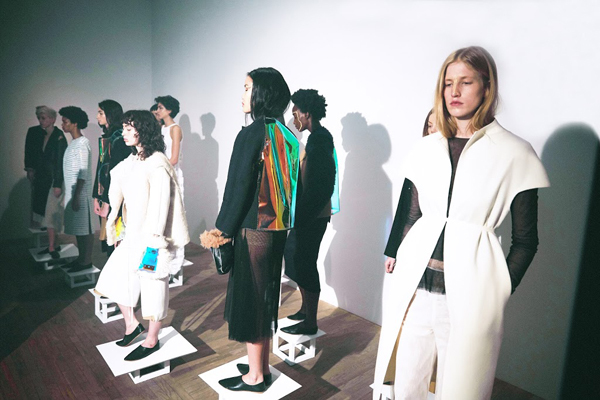 Ab[Screenwear] is about merging traditional and emerging modalities – in clothing and media. Luxury materials have this very tactile, sensual, warm appeal. It represents “tradition” & physical body, to me. For new optics and haptics – something that speaks to the digital component of our lives – I often go to hardware or architecture supplies stores.. Finding “gems” outside of fabrics stores is my jam! I am interested in Wearables that are ready-to-Wear. Not biometrics or wearable devices, not tech-couture, but rather real garments made with all the right design decisions about construction, fabric combos, fit and finishes. This sensual, tactile quality of well made clothing is personally very important to me. I want Wearable [tech] to be ready-to-Wear: “medium”, after all, “is the message”. The new A2/17_Postmasters collection features jackets in fine merino shearling, wool and cashmere. Some are reversible, others have modular construction and come with matching liners, cutoffs and vests, that offer versatility and leaner silhouettes. 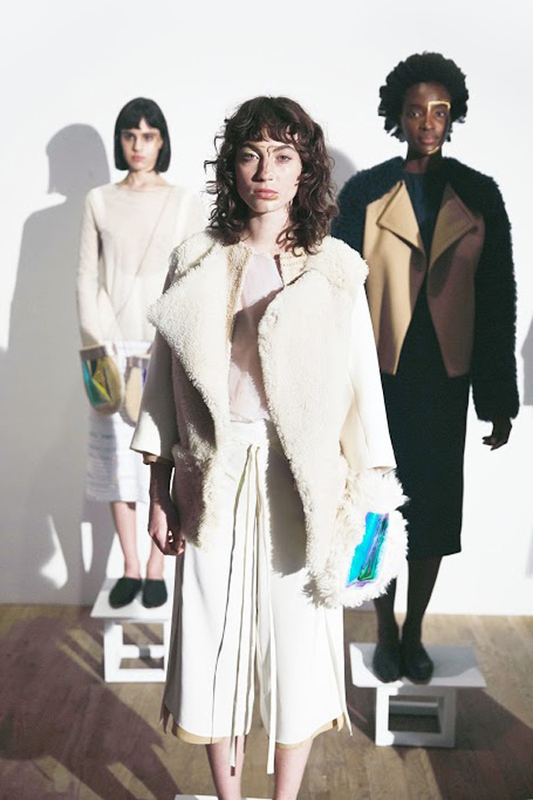 The collection also offers a sneak peek to Ab[Screenwear] accessories – oversized touchscreen mittens/ cellphones – in merino shearling and sheepskin. They come as single pieces or as a pair, a luxurious cradle for one’s alias self. 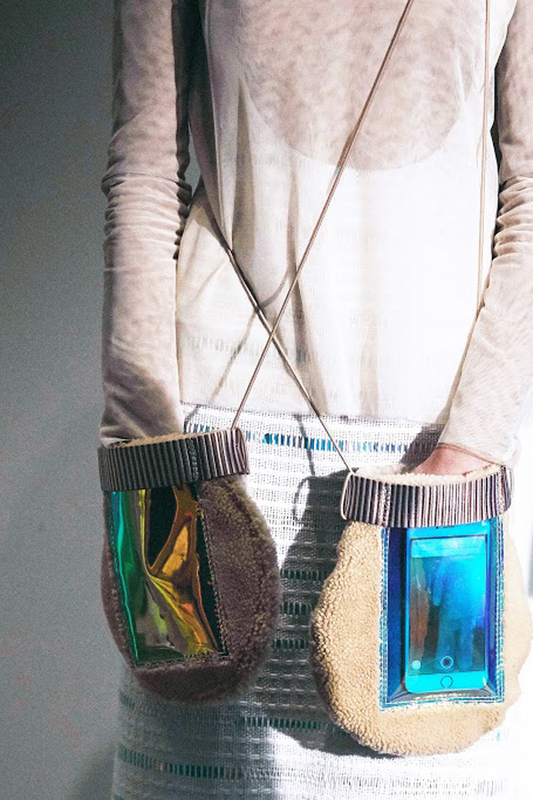 CSG: What role does wearable technology play in fashion? OPJ: Right now, fashion and tech worlds are not really integrated with each other. There is a mutual interest, but things are sort of slow.In the near future this conversation may become more and more practical i.e. tech luminaries will have access to companies with fashion expertise and vice versa. I think tech industry’s mentality (sharing, open code, access, democratization, etc) is quite opposite to fashion’s exclusivity, enclosure, cult-like following. It isis interesting to see if any new forms of interaction with audience might will be born in the intersection of fashion and tech.